This will be the 9th Residential Latin Course organised by the Latin Mass Society. The course ends at lunch time on Friday, 2nd August. The Latin Mass Society’s Latin coursebook, Simplicissimus, is used as an aid in the course, and all participants are given a copy. We will be using a thoroughly revised and corrected edition. Discounts are available for paid-up LMS Members, full-time students, seminarians and priests. If you are not already a LMS member, you can join now and claim the appropriate discount off the price. The saving on the Latin course fee is greater than the annual membership fee for the LMS! We also offer an option without accommodation, if you would like to arrange your own or live locally. Single and shared rooms in the Guest House (no ensuite bathrooms): single rooms are available, subject to a single room supplement. Full price is £390 (+ £45 optional single room supplement); without accommodation £250. LMS Member £340 (+ £45 optional single room supplement); without accommodation £200. Clergy, students and Seminarians full price £290 (+ £45 optional single room supplement); without accommodation £200. 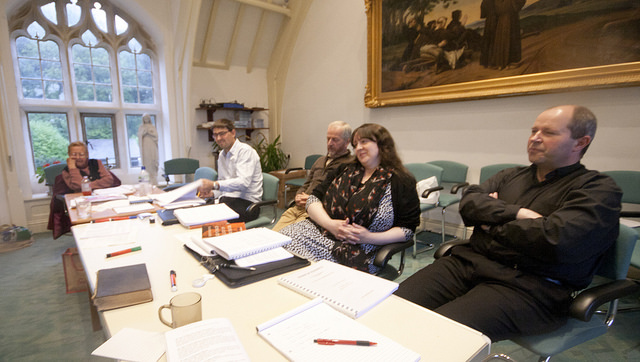 Clergy, students and Seminarians LMS member £240 (+ £45 optional single room supplement); without accommodation £150. Combined Latin Course and Membership Package £370 (+ £45 optional single room supplement); without accommodation £230. Are you an LMS Member? Would you like to take out LMS Membership? Are you a Student, Seminarian or Clergy?